This fall, trade your traditional pumpkin pie for this lighter dessert. it will nourish your body and satisfy your sweet tooth. Put medium bowl in freezer. 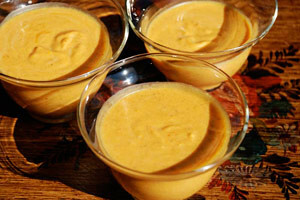 In a large bowl, mix pumpkin and yogurt, using a whisk. Sprinkle gelatin on orange juice and let sit for about three minutes, just enough time to get maple syrup ready. Bring maple syrup to a boil on medium-high heat in a small sauce pan, stirring constantly. Pour boiling maple syrup over orange juice and stir until gelatin has melted. Pour maple syrup mix into pumpkin preparation and mix well, using a whisk. Add orange zest and spices; stir to combine. In chilled bowl, whip cream to firm peaks, using a hand mixer. Use your mixer to whip pumpkin mix for about one minute. Fold whipped cream gently into pumpkin mix, using a spatula. Ladle into serving cups and chill in the refrigerator for two to three hours, until set.